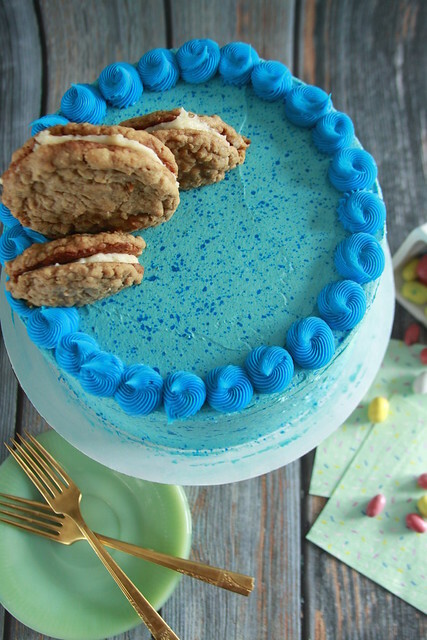 As we transition into the rainy springtime month of April, this Oatmeal Cream Pie Cake perfect! The developed flavor of brown butter gives the cake and frosting an unsurpassed taste that warms your tongue without any overpowering spices. 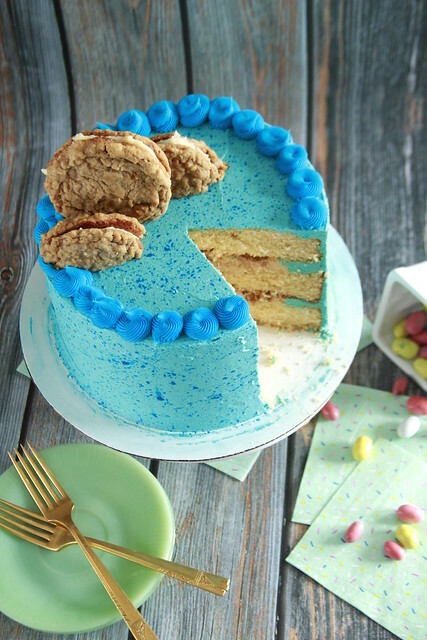 To drive home the theme, oatmeal cookie dough with oatmeal cookie chunks fills the cake layers. 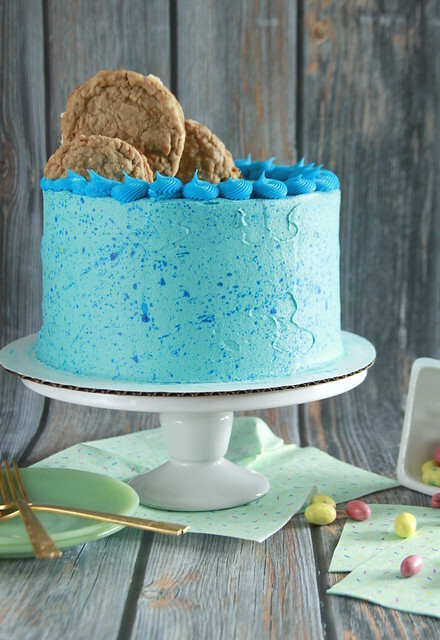 Finally to liven things up, the cake is speckled for Easter with a two toned blue design! How long can I keep this dialogue of enthusiasm up? I am not certain, I can only type with this guns-blazing-saccharine tone for so long. After I few posts, my true snarky and bitter humor floats to the surface. I spend evenings backspacing over my typed drafts. I have no insightful and engaging personal commentary to spice up posts. Real life gets too heavy—it’s too wet and depressing to post on here. People use food, food blogs, and food photos as a means of escape and why should they spend time on here with such bad vibes? Exactly. People aren’t attracted to negativity. As I see it , it’s best to be like a retired Bostonian-Irish man sitting at a bar at 11am—bottle up those thoughts and opinions and bury them with you to the grave. Unless you somehow make it and become famous—only then does dark humor and dysfunctional realities become relatable and edgy. Again I digress, what was I thinking writing without exclamation points and saying things like scrumptious, tasty, and divine? 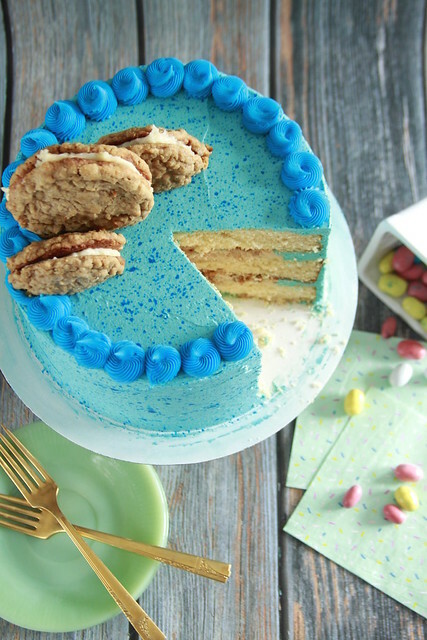 At first glance, this Oatmeal Cream Pie Cake does not shout SPRINGTIME, but in fact this flavor really is perfect for April. Boulders of plowed snow are finally melting. Days are overcast, gray with misting rain. The ground is brown and bloated from water. Asphalt is cratered, winter potholes brimming like a million little lakes. You need the cozy flavor of brown butter to warm you up on these damp April days. Here the butter is browned, chilled to solidify, and brought to room temperature. This process allows you to have the flavor of brown butter and the height you get for a butter based cake and frosting. I did not provide a recipe for the oatmeal cream pie, it is up to the discretion of the reader. My cookie preference falls into the school of chewy and doughy. 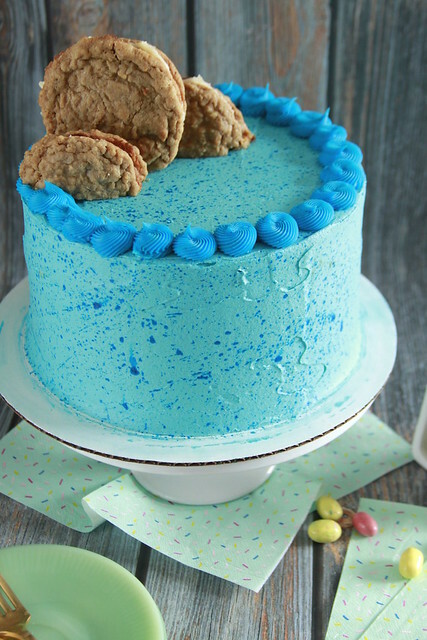 But to make this cake, I had to sacrifice my under-baked cookie love and go with a thinner, crispier cookie. I used Martha Stewart’s recipe for Oatmeal Cream Pies, substituting rolled oats with quick cooking oats. 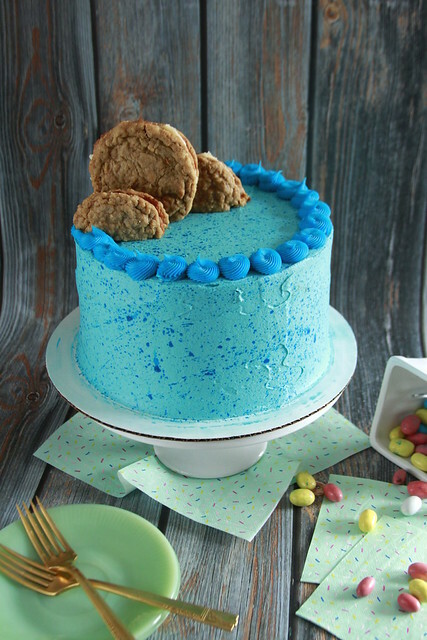 To make the speckled design for the Oatmeal Cream Pie Cake, I diluted blue food gel with water. Double coating a work surface with news paper and wearing gloves is highly suggested, because you’ll be spraying food dye everywhere. 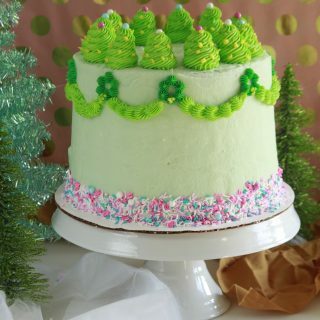 Follow this tutorial to get the exact details on the decorating procedure. Enjoy the start of this damp spring weather with a classic satisfying brown butter oatmeal cream pie goodness! In a stand mixer fitted with a paddle attachment, beat butter on a high speed until smooth, white, and fluffy, about 4 minutes. Add oil and sugars, creaming at a medium speed until combined, about 3 minutes. Scrape sides and bottom of bowl down. Whisk buttermilk and vanilla in a spouted bowl. With the mixer on low, add dry ingredients in three additions alternately with wet ingredients in 2 additions. Beat until flour just disappears into the batter, do not over beat. Give the batter a few gentle fold by hand with a rubber spatula. Divide batter evenly between the prepared pans. Bake for 20 to 26 minutes, rotating halfway. A toothpick inserted should come out mostly clean with a few moist, not wet, crumbs. 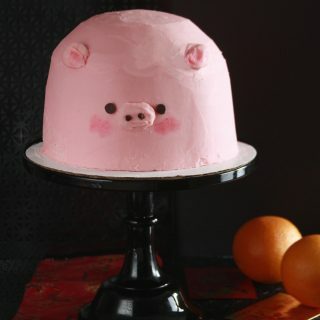 Do not over bake these cakes. Let cakes rest in pans for 5 minutes before inverting onto a wire rack to cool completely. 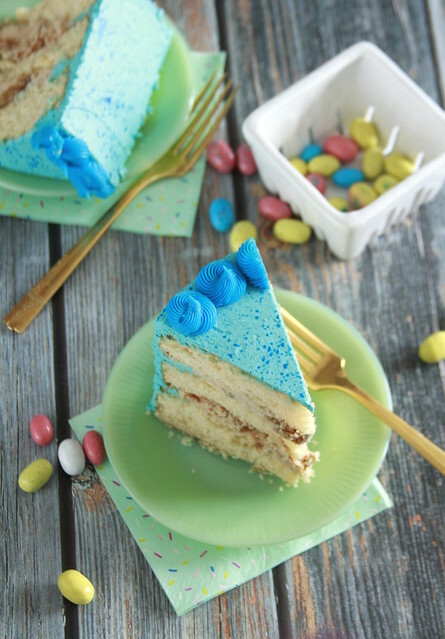 For a moister cake, wrap cooled cake layers individually in plastic wrap and refrigerate overnight. Beat butter in a stand mixer fitted with a paddle attachment. Once smooth and fluffy, about 3 minutes at medium-high, add sugars, and cream until smooth and combined, about 2 minutes. Scrape down sides and bottom of bowl. With the mixer on low add oats, flour, cinnamon, salt, sour cream, vanilla extract, and almond extract, beating until combined. It should have the consistency of a thick brownie batter. Refrigerate until assembly. Beat butter in a stand mixer with a paddle attachment, until butter becomes smooth and pale in color, about 3 to 4 minutes. Add cream cheese, beating until combined, another 2 minutes. With the mixer on low, slowly add the powdered sugar followed by the salt, milk, and vanilla. Scrape sides and bottom of the bowl as needed. Raise speed to medium-high and beat to get fluffy, 1 minute. Tint frosting blue and refrigerate until assembly. Spoon frosting onto a cake board. 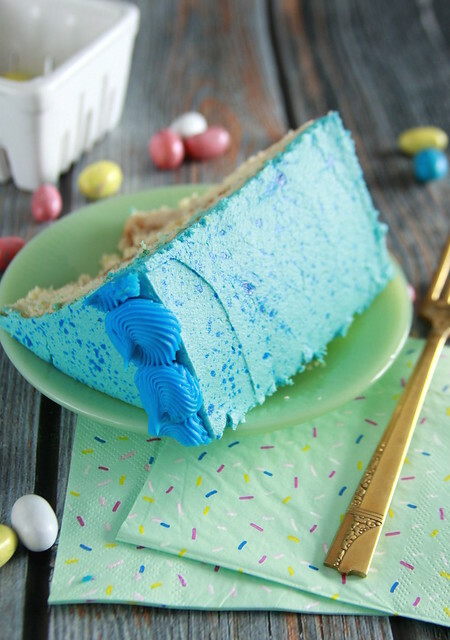 Secure first cake layer on, pipe a perimeter of blue colored Brown Butter Frosting onto the outside of the cake. Spoon in the Oatmeal Cookie Dough Filling, using an offset spatula to even it out. Press broken up Oatmeal Cookies into the filling. Repeat this process with the next layer and top with the final third cake layer. 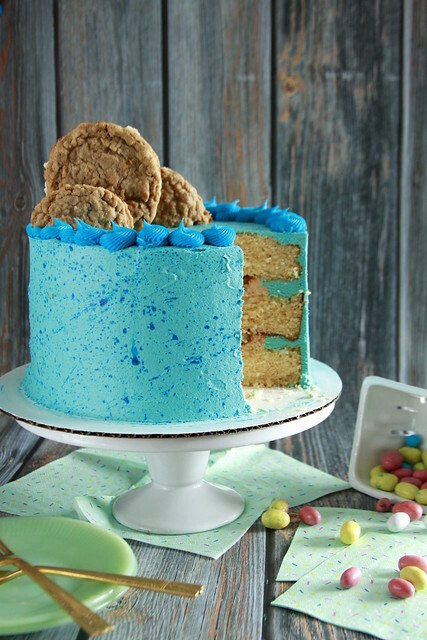 Apply a thing crumb coat of frosting, chill for 10 minutes, and then apply a final thicker cake layer. Chill for 15 minutes. Line a work surface with several layers of newspaper. Combine food gel and water together. Lay the cake onto the newspaper. Wearing plastic gloves, dip a brush into the blue mixture, and use your index finger to flick the bristles. Do the first flick onto the newspaper to eliminate any excess. 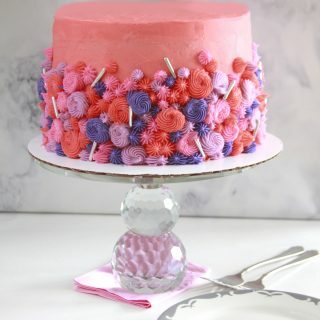 Gently flick the dye onto the cake surface creating a speckle pattern. 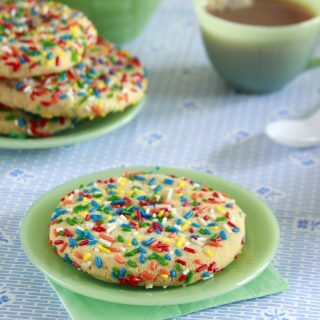 Refrigerate cake to dry speckles. Pipe a border on top, garnish with Oatmeal Sandwich Cookies.